A ranch rail fence is considered to be one of the traditional fence styles for use with horses. They are still commonly seen on horse ranches, and the rails and posts are usually made of wood, although vinyl is becoming more and more popular as a fencing material. A ranch rail fence is what you would often expect to see running the perimeter of a field containing horses, and are also sometimes called a 3 rail fence or 4 rail fence. Don’t buy a ranch rail fence until you have compared all options! Give us a call to discuss the details: 877-306-4024. Wood fencing overall tends to become a snack for some horses. They like to chew on wood (this problem is called “cribbing”), and eventually the fence gets chewed through and falls apart. Of course, “escape” was not the horse’s intention in chewing up the fence, but she will take advantage of the opportunity when the top rail falls to the ground. A ranch rail fence is exposed to the elements – including temperature changes – all the time. When the wood becomes alternately cold and warm, the nails holding the fence together become loose. Over time, this means the rails will come loose and fall out. Not only does this compromise the security of your fence, it also leaves nails exposed which can severely injure your horses. Whether it is made of wood or vinyl, a ranch rail fence will require ongoing maintenance. Wood, once painted, will continue to need repainting to avoid moisture and rotting. The part that you cannot paint is the bottom of each post, because it is in the ground. It will eventually rot and need to be replaced as well. A vinyl ranch rail fence will have rails that break, fade in color, and start to sag after a while. Rails that sag low enough will fall out, so they will have to be replaced before that happens. Since no fence lasts forever, you have to also consider the life span of your ranch rail fence. For vinyl, you can expect about 15 to 20 years, and for wood usually around 10 to 15 years. This is after you have repaired the fence until it is no longer really repairable with any degree of efficiency. Stretching out the life of a worn-out fence is only prolonging the inevitable, and if it puts your horses at risk it’s definitely not worth it. We have a much better solution than wood or vinyl. Strength – It’s stronger than wood and vinyl. No need for redundant fencing or a layer of electric wire on the top rail. Once a horse tests it with that first push, it becomes obvious that this fence is not going to be breached. Maintenance – There is no maintenance required. The Steel Board Fence components will not sag or splinter, nor are they subject to any effects of moisture. You will not have to paint them, ever. 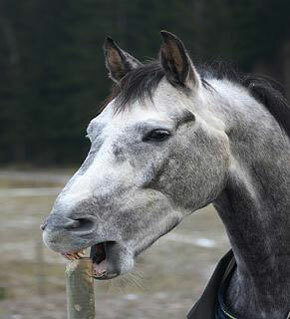 Your horse will not chew them. It really couldn’t be easier. Temperature effects – Our fences are not negatively affected by the effects of temperature changes, so there is no worrying about rails falling out due to thermal cycling. One less thing to worry about. Life span – This is a huge benefit. Our Steel Board Fence will last on average about 35 plus years (we also have an aluminum pipe fence that you can expect to last 50 years or longer). Yes, our Steel Board Fence costs more to install. However, taking the above factors into account, it is actually the most cost-effective alternative. You will replace your wood or vinyl ranch rail fence 2 or 3 times before having to think about replacing ours, not to mention all of the other factors. Give us a call 877-306-4024 and let’s discuss your needs and how we can help you. Or contact us and someone will be in touch with you shortly.